Now we can announce the Headquarters location for Scavenge Garland. 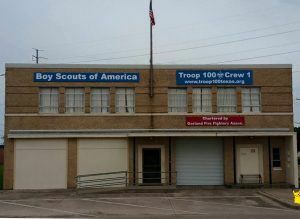 You’ll check in and find many of our sponsors at the Troop 100 building, which is the old original Garland fire station at 116 S. 6th Street, conveniently located right across Avenue A from the Senior Center where you can find plenty of parking for the event. The Boy Scouts will be camping and helping the Garland Firefighters Association with an event that day, so we won’t see much of them. But we’ll have tents and tables set up for our volunteer staff and sponsors and this is where you will check in when you arrive. It’s also where you will receive your t-shirt, lanyard and swag bag.